18 August 2006: As the successor state to most of the territory once governed by the Soviet Union, the Russian Federation could be thought to embody the essence of local democracy, as the word ‘soviet’ is in fact Russian for ‘council’. Though Russia is considered by many to be a centralised regime with a strong-arm president in the form of Vladimir Putin and his United Russia party, in such a vast territorial expanse, regional governors and city mayors are often the true definition of what can be considered the state in the post-communist era. Following the Russian Revolution of 1917, the Soviet Union was proclaimed and the process of accumulating further territories under its banner was begun, with the treaty confirming its creation signed in 1922. The history of Russia during the next 70 or so years therefore corresponded with that of the Soviet Union, whom it superseded diplomatically following dissolution in 1991. Today its territory stretches from Poland to China and closely neighbours both Turkey and the US over water. The territorial expanse and the history of both Imperial Russia and the Soviet Union are both major considerations in the composition of its federal structure and the relationships between the centre, the regions and the cities and municipalities beneath. Since the referendum of December 1993, which approved its existence, the Russian constitution states that it is a federal republic governed by a strong executive president with a bicameral Federal Assembly, the 450-member State Duma (lower chamber) and the 178-member Federation Council (upper chamber), which like the president are elected to four year terms. Russia itself, as its full name suggests, is a federation, which consists of 88 subdivision entities of varying autonomy and nature. This was recognised in the Federation Treaty of 1992, which was signed by Moscow and each of Russia’s autonomous republics. Of the 88, 21 are styled ‘republics’, each representing an ethnic or linguistic minority (ie. non-Russian) and with notional full autonomy and their own constitutions and political character. Secessionist tendencies and the desire on the part of some republics to legislate against the provisions of the Russian federal constitution has seen President Putin impose seven ‘federal districts’ over the 88 entities (including appointed governors), along with a drive to increase the powers of regional legislatures over executive governors (which are now also appointed centrally). Another type of entity is the 48 ‘Oblasts’, which are the most numerous and are each named after their capital city. Again, these are headed by appointed executive governors and elected legislatures. There is also a well-known separate Jewish Autonomous Oblast on the border with China, which was created by Stalin in the 1920s as the homeland for Russia’s Jews under his nationality policy. The seven ‘Krais’ occupy the same status as oblasts but are known differently by virtue of their historical association. Nine ‘Okrugs’ occupy a status in between that of republic or oblast in terms of autonomy, each having ethnic minority status. Finally, the cities of Moscow and St Petersburg are Russia’s two federal cities and as such enjoy status above that of other Russian cities. Under its constitution, a number of powers are entrusted to the central authority, though there is also some flexibility in the sharing of powers between the centre and each region. Across Russia the situation does vary however, with some problems since the introduction of the constitution and the attitudes of some republics, with the imposition of federal overseers and the intervention of the federal government in the affairs of some regions. Beneath the sub-national tier of republics, oblasts, krais and okrugs, a common system of districts (more commonly recognised as counties elsewhere), cities and towns (under the jurisdiction of the sub-national body) and rural districts exists. A third tier of towns under the jurisdiction of the districts also exists. The majority of sub-national bodies have adopted federal legislation concerning the local government autonomy and 10,955 municipalities are endowed with a charter outlining their status. Furthermore, each locally is permitted to model its own governance arrangements to reflect local circumstance, custom and complexion. Of the 12,215 municipalities in Russia, 625 are cities. Depending on where in Russia, most are headed by some form of mayor, of the 12,045 municipalities with elected bodies, 4,519 elect a mayor. Once again, powers and responsibility tends to vary across the republics on account of the ability to model their own governance, though there are common factors in the provision of education or in environmental matters, for instance. In some unpopulated or barely populated areas, no local government exists. The two federal cities of Moscow and St Petersburg, the two historic centres and capitals of Russia, both enjoy special systems of government. 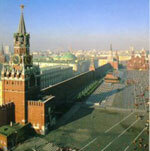 Moscow is divided into 10 administrative okrugs and 123 municipal districts, with a mayor overseeing the city itself. Yuriy Luzhkov has served as Mayor of Moscow since 1992, having been appointed by Boris Yeltsin in 1992 to replace Gavril Popov, the city’s first freely-elected mayor. The mayor is now elected on a four-year term. St Petersburg is divided into 18 city districts, which are further subdivided into an array of local administrative units, including nine cities/towns, 21 settlements and 81 districts. Ms Valentina Matvienko is the elected Governor of St Petersburg. Moscow, capital of the Russian Federation, is currently building a new City Hall that will be the new home of the city duma. The duma is comparable to other European city councils, with Moscow’s local government as well as the Mayor of Moscow, Yuri Luzhkov, answerable to it. Mr Luzhkov has been mayor since 1992 and has had an undoubted influence and authority over the capital city's government. Born in Moscow in 1936, he joined the city council as a deputy chairperson in 1987, rising to head chair in 1990 and then to vice-mayor from 1991 to 1992. 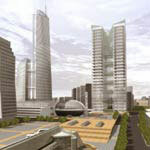 Currently under construction, the new 70-storey towers will rise 308.4 metres into the Moscow skyline. The project consists of four super-tall skyscrapers with several two-storey bridges between towers and eight storey bridges at the top. The highest bridges will be built in the shape of the letter "M", standing for "Moscow". The city’s plan is to concentrate all centres of administrative authority within the new complex to provide an efficient organisation that will provide an improved service for both citizens and investors. Currently, the city government is using hundreds of smaller buildings throughout the city for various services and activities, and when the new building is completed the old buildings in use at the moment will be sold. Work on the new city hall began in November 2005 and will be completed at the end of 2007. The new city hall will be symbolic of this type of building.